The best cheap business class flights to Philadelphia from London we found for a client in the past month were for an amazing £1,624 return. To get today’s best price simply complete the form on this page and we’ll get back to you quicker than you can say “Liberty Bell”. British Airways and American Airlines all offer direct flights from London. 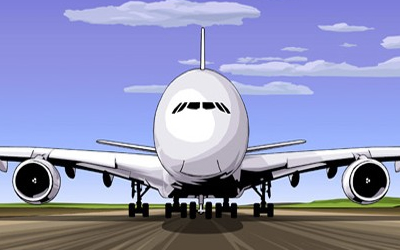 British Airways operates the route with a Boeing 747 and is a codeshare partner with Finnair and American Airlines. The airline’s Club World product features a lie-flat bed with comfy bedding from The White Company, including a bespoke luxury duvet, a luxuriously soft large pillow and white cotton pillowcase. You’ll also have a 10.4 inch entertainment screen, power sockets, noise cancelling headset and plenty of space to work. Business Class with BA grants you access to the airline’s Galleries Lounge at Heathrow, and you’ll also be able to take advantage of a complimentary treatment in the Elemis Travel Spa before your flight. American Airlines utilises an Airbus A330 from London to Philadelphia. The A330 features lie-flat seats in a 1-2-1 configuration measuring 20.5″ wide, with power sockets and personal entertainment screens. Amenity kits contain travel essentials from leading skincare and lifestyle brands C.O. Bigelow and Cole Haan, and you’ll be supplied with a Bose noise cancelling headset so you can watch a movie without the sound of cabin noise in the background. If you wish to hail a taxi, there is a $28.50 flat-rate charge (one-way fare, airport access fee already included) to travel to Center City Philadelphia. This area encompasses: Fairmount Ave (North), South Street (South) Delaware River (East) and University City/ 38th Street (West). If you’re travelling outside these boundaries, your taxi will be charged on the meter. Alternatively you can take the train between the airport and city centre. Just take the Airport Regional Rail Line operated by Southeastern Pennsylvania Transportation Authority, SEPTA. Trains run every 30 minutes and operate from 4:52 am to 11:52 pm (Center City to Airport) and from 5:07 am to 12:30 am (Airport to Center City). Why not compliment your business class flights to Philadelphia with a stay in The Loews Philadelphia hotel, which is located in USA’s first skyscraper – a landmark building in the city centre of Philadelphia. The hotel is located just steps from the Pennsylvania Convention Center and features 581 guest rooms with complimentary Wi-Fi. Facilities a fitness centre, swimming pool and function space, as well as a restaurant – Bank & Bourbon – which serves American fare with a modern twist. The Kimpton Hotel Monaco Philadelphia is another great choice, offering luxurious rooms and suites in a posh 1907 building that’s an adaptive reuse project of a storied building located on the country’s most historic mile. Highlights include a cozy pub-style restaurant called Red Owl Tavern and a buzzing rooftop bar perched 11 stories above some of Philly’s most historic sites. Divided into a large outdoor patio, indoor bar and two pavilions, this is definitely the place to go if you’re looking for a night out with craft cocktails and live entertainment. Independence Hall – This historic building is where the Founding Fathers signed the Declaration of Independence and where – just 11 years later – representatives from 12 states gathered to shape the U.S. Constitution. Reading Terminal Market – Foodies will love this farmer’s market, which is the oldest in the United States. Here you can chow down on all sorts of fresh foods, including roast pork sandwiches and duck noodle soup. The Rocky Steps – Don’t miss a chance to recreate the famous Rocky scene and jog up the steps of the of the Philadelphia Museum of Art, pumping your fists in the air. Once you’ve done that, head to the bottom of the stairs and have your photo taken with the bronze statue of Rocky, originally created for Rocky III. 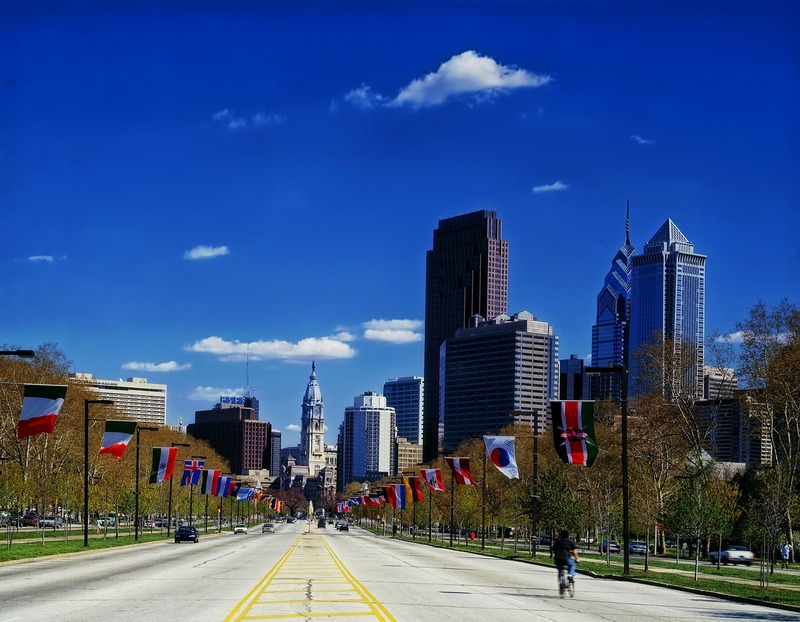 British Citizens can travel to Philadelphia for up to 90 days by applying for an ESTA online. The ESTA is valid for two years, for multiple entries. Spring (March to May) is a great time to visit since hotel rates are affordable and the weather starts to warm up after the cold, often harsh, winter. Summer (June to August) is peak season and therefore very popular with tourists, which drives hotel prices up. We will find you special, discounted fares that are not available online. So, by the time you take your business class flights to Philadelphia, you’ll feel happy knowing that you’ve paid less than the person seated nearest to you! Have a great trip and – if you want to save money – please book with SkyClub.